Are Solar Panels Really Worth the Money & Effort? You’ve heard the pitch, “Save thousands of dollars by going solar!”. But is that true for you and how can you get through the hype and determine the truth. What are you currently paying for your electricity? This is probably going to be the most important factor that you will be considering since your goal from installing solar is to lower the cost of powering your home. If you look at your current electric bill, you’ll see that your bill is based on the number of kilowatt-hour (kWh) you use. Costs per kWh can vary greatly based on where you live. Make sure when determining your savings you are using your actual cost per kWh and not calculating your savings based on a generalized article or ‘worksheet’ you’ve found online. Obviously those homeowners with the highest electricity rates will most likely save the most by switching to solar power. What will a switch to a Solar Panel System Cost to Install? When considering the solar company you will use for this major investment, going with the lowest bid just because it’s the least out of pocket, may cost you far more in the long run. You must consider both your short term and long term gains when choosing equipment and the company that will design and install your system. Take your time. Meet with multiple companies and don’t be afraid to ask very specific questions about them, their installation team, their warranties, etc. With all the research and details available online, prepare for your meetings with the companies by creating a list of specific questions you need answers to in order to choose. Take notes. Get all your questions answered. If they are trying to rush through your appointment, rush them out your door! Don’t be afraid to ask about any incentives or discounts they may currently be offering BUT don’t get pushed into making an immediate decision “or else lose today’s special price”. That’s probably the first company you should cross off your list. note: Odds are pretty high that if you called them the next week and told them you would like to hire them but at the discounted price, they will say yes. Speaking of incentives….check in your city, county and state to see if there are any energy incentives and rebates available. These can sometimes reduce your net cost by 50% or more. The federal government offers a 30% solar tax credit (search online for details and ask your tax professional for how you personally could benefit). Hard to believe but true…some utility companies even offer rebates to their customers to encourage their switch to solar power. Check your utility company’s website for details. Only you can determine if the switch to solar offers you enough benefit to outweigh the initial costs. As in any big decision, due diligence is the key! We’ve talked in past Green Living blogs about how important it is to purchase an energy-efficient toilet in order to save water, energy and money. Older toilet models use more than three gallons of water per flush, whereas low-flow, energy-efficient models use less than 1.5 gallons per flush. But let’s face it. We’re dealing with a tough economic time right now and some of us can’t afford to purchase improvement projects for our homes right now. Fortunately, there are DIY ways to save water, energy and money with the toilet you already have! For many of us, the kitchen is the center of our home. It’s where we cook and share meals, it’s where we spend our mornings and evenings, it’s where we congregate when friends come to visit. So it makes sense to start with the kitchen when you’re looking for quick ways to implement a greener lifestyle. Think about it: if there are a few small changes you can make to improve your home’s eco-friendliness, beginning in the kitchen, why wouldn’t you? Turn your dishwasher’s water temperature to a lower setting, if possible. Heat small things up with small electric pans or toaster ovens rather than your large stove or oven, and you may cut your energy consumption by two thirds! Check the oven by turning the light instead of opening the door, which reduces the temp by about 25 degrees and increases cooking time. Use energy-efficient lighting when you can’t just use daylight. Install energy-efficient appliances. Old refrigerators alone use so much energy, they can account for 15% of a home’s consumption! Look into Energy Star options for savings. As we’ve said before here at the Buy Owner Blog, green living is not only good for you while you live in your home, but it’s also beneficial for resale. 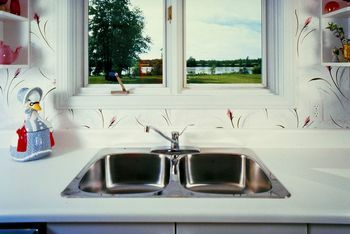 Implement these simple tips to be on your way to a greener kitchen and therefore a greener home! When you Google search, notice that a lot more DIY websites are popping up? DIY, or do-it-yourself, sites provide you with directions on how to build, install, remodel, landscape and fix without hiring professionals. If you have the skills, DIY work could save you loads of money. Especially if you’re fixing something that you already have instead of replacing it. Fixing items around the house could save you ample amounts of money while also saving the environment from access waste and toxins. Fixing items around the house used to be second nature, and now that people are pocket pinching, the method is coming back in style. According to The Daily Green, a rule of thumb to help you decide whether you should fix or replace something is to fix it if the repair costs are less than 50 percent of the original price. Little items around the house can easily be fixed with a little tape or glue. Snap a broken piece of picture frame back into place with a drop or two of Super Glue. If the glued spot looks shinier than the rest, camouflage it by applying a glossy finish to your frame. Glue is also helpful with dishes, clocks, laundry baskets and more. Larger items, like electronics, get a bit trickier. If the electronic seems broken, try switching the batteries in the remote or replacing the power cord. Oftentimes, the gadget itself isn’t broken, just a smaller part of the whole is. If you’re not sure how to repair your gadget, call the manufacturer or look up guidebooks to help you figure out how. The time you spend learning the tricks of this trade is well worth it if it comes in handy again in the future. Also, oftentimes the electronic or appliance isn’t broken, it’s just temporarily impaired. Taking apart an object to clean out the dust inside, changing a filter or replacing one small part can often fix the problem. You can fix outdoor items instead of replacing them too. First off, plant perennials instead of annuals. You can pull weeds, fertilize and fix up perennial gardens year after year instead of constantly replacing the flowers. If a potted plant seems to have died, try moving it to a new location, watering it more or less, and adding organic nutrients before you entirely give up on it. When it comes to surfaces, you can easily fix up holes and cracks. Fill cracks in cement with small amounts of fresh cement. If one piece of your wooden deck has rotting, replace just that piece. Sand, stain and paint surfaces to make them last as long as possible. Furniture is simple to fix. First off, if a piece of your furniture looks worn, simply cover it with a slipcover and it’s as good as new! Slipcovers can easily be taken off and washed too. Upholstery shops allow you to change the fabric and add cushioning so an old piece of furniture seems as good as new. 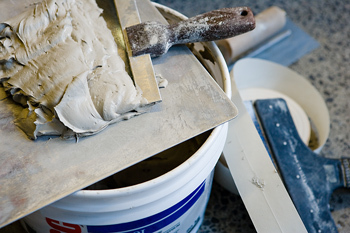 Sealing and caulking are jobs that you should become familiar with. They can be used to your advantage all over your house. If you have a window that air gets through, seal the edges with weather-stripping. Caulk and seal your attic and basement before replacing an air-conditioning unit to see if that does the trick. Seal and caulk pipes to prevent or fix leaky faucets or toilets. For more tips on what to repair instead of replace, read The Daily Green article here. About 60 percent of a home’s water usage comes from the bathroom. Want to incorporate green living into your bathroom but not sure where to begin? There are numerous ways to conserve water and energy in your bathroom; thanks to an interactive diagram provided by National Geographic’s Green Guide, you can view exactly where you can conserve and go green in the bathroom here. Bath/Shower: While you might think taking a bath uses less water than a shower because the water isn’t constantly running in a bath, it actually takes about 70 gallons of water to fill up a bathtub. You only use 10 to 25 gallons in a five-minute shower. Low-flow showerheads are readily available now, which release less water at a time. By replacing your showerhead with a head that releases 2.5 gallons per minute instead of the average 4.5, you could save 20,000 gallons of water per year! Faucet: Faucets can waste up to five gallons of water per minute. To decrease this number, attach an aerator to your faucet, which could decrease your gallons per minute from 1 to 2.75 gallons. Regardless, while you brush your teeth and wash your face, turn the water off. Only run it while you are directly using it. Toilets: Toilets account for about 26 percent of water usage in a home, and the older your models are, the more water they use. 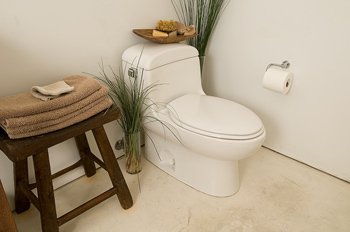 If you replace a toilet from 1992 or older, you could save up to 25,000 gallons of water per year! Newer toilets have multiple options, such as dual flushes with a low-flow flush for liquids and a more powerful flush for solids. Composting toilets and no-mix toilets are two other options. When choosing a toilet, look for ones with an EPA WaterSense label. Toilet paper: The United States uses 100 million tons of paper per year, and toilet paper is a large contributor. Look for paper that is recycled or thin and easily biodegradable. Use fewer squares at each sitting. Leaky pipes: Toilets and faucets often contain leaky pipes, which waste up to 11,000 gallons of water. Fixing leaky pipes will save water and money, helping your bank account and the environment. To test for a leaky toilet, drop some food coloring into the tank and see if it appears in the bowl without flushing. For more interactive diagrams and exact ways to cut costs in other rooms, click here. All of these statistics were taken from National Geographic’s Green Guide. Wondering how the Internet has been buzzing with green information over the last month? Check out this roundup of great articles, filled with information and stories about green living as it relates to real estate and home building! USA Today, “My green house project sparks debate, criticism,“ by Wendy Koch. This is an interesting read. Not only does it provide a real-life example of someone who chose to build a green home, but also it addresses some of the criticisms lobbied in response. KAALtv.com, “Riverland House Goes Green” by Kristin Martin. Carpentry/electrician students at Riverland Community College in Austin, Minnesota, built a Green Star home to sell. According to the article, this residence showcases “innovative concepts” that should continue to grow in popularity. Newsday.com, “Montauk house to tell owner when being ‘green’ pays off” by Cathy Mahon. Experts say that one of the easiest ways to spruce up a room is to repaint it. Even if you choose neutral colors, the fresh coat will brighten the walls and hide any signs of wear and tear. 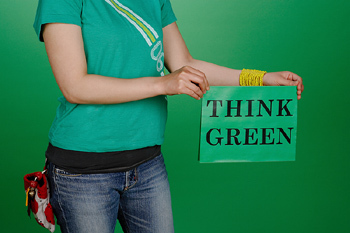 As long as you’re making a change, why not make it as green or eco-friendly as possible? Because so many types of paint are available, we’re here to assist you in choosing the safest and greenest type for your house! Always choose paint with low volatile organic compound levels, or VOC levels. These levels can pollute your air with dangerous chemicals when used in high dosages. Look for paint with less than 150 grams per liter of paint, or for paint labeled low-VOC or no-VOC. Natural paints are a smart option for houses located in dry conditions. These paints are naturally made from plant ingredients, do not contain preservatives and are not synthetic. If you need a synthetic paint, choose water-based latex paints instead of oil-based alkyd paints. The water-based paints have less chemicals and lower VOC levels. Milk paints contain no preservatives or solvents, but they do contain some synthetic ingredients. This natural, odorless paint is made with milk protein and comes in powder form. Once mixed with water, it needs to be used quickly. Recycled paint is available for rooms where consistent color is not required. This paint is literally made from recycled and consolidated old paint, so numerous colors may be mixed together to create a unique hue. If you’re painting your walls white, opt to use whitewashes, which are paints naturally made from lime paste. These paints are affordable and great for stucco exteriors, basement walls, garages and more. Deciding which type of paint to use will depend on what room you are painting and what purpose you have in painting it. Once you decide on a type, make sure to keep the room ventilated while you apply it, no matter how eco-friendly the paint is. Afterward, donate or recycle your leftover paint and enjoy your freshly painted room with low levels of toxins! You may have heard about the recent investigation conducted by the U.S. Government Accountability Office (GAO) on Energy Star rated appliances, which found that the Energy Star program is vulnerable to fraud and abuse. This Energy Star program began in 1992, managed by the U.S. Department of Energy and the U.S. Environmental Protection Agency. Appliances with Energy Star ratings are said to use less energy and release less pollutants. Because government tax credits are available for consumers who purchase Energy Star products, $300 million from the American Recovery and Reinvestment Act is expected to be used for this purpose. To test the reliability of the Energy Star rating, GAO submitted 20 fictitious products with energy-saving claims. Of these 20 products, 15 were accepted by the Energy Star program, proving that the program is vulnerable to fraud and abuse. The program does not verify energy-saving data submitted by manufacturers, which means manufacturers are basically self-certificating their products. To read the entire report from GAO, click here. What does this mean for consumers like you who are trying to make your home more energy efficient? It means that you should still strive to purchase products with Energy Star ratings. Though the program might have certified products that aren’t truly energy efficient in the past, the program agreed to strengthen the program with a more rigorous screening process. To read how EPA and DOE plan to make the program more efficient in the future, click here. This investigation is wholly positive for consumers like you, because from now on, you can rest assured that a close eye will be kept on items that pass with an Energy Star rating. The program will be stronger than ever, as will the energy efficiency levels of the products. If you still have a hard time trusting the program, research a product before you purchase it to find out the average energy usage that it uses per year. Don’t give up on saving energy and receiving tax credits for doing so! Performing a personal energy audit is a great way for you to review energy usage in past years, discovering where you can decrease usage in order to decrease bills. Plus, it’s also a great way to promote your energy savings to potential buyers when selling your home! Organize the past few years of your energy bills into spreadsheets by writing down how much energy you used and what the energy bill cost each month of each year. Separate into categories when available, such as heating costs, cooling costs, lighting costs, etc. To obtain old energy bill records, call your utility company’s customer service number. Study the data to see where your energy costs fluctuated, and why. Highlight trends that you notice, such as your lighting costs increasing every December when the daylight hours become shorter and the holiday lights are turned on each night. Do you always use more energy in specific months? Did the charge from your utility company increase? This will help you determine what is causing the bill to fluctuate and where you can cut the most costs. Once you have your past energy bill costs laid out in an organized fashion, begin investigating your home for areas that need energy-saving improvements. If you have purchased or are purchasing energy-saving products, such as fluorescent light bulbs, Energy Star appliances or eco-friendly insulation, write down when you installed or are installing these items. Mark down how much the product cost you, and how much you save compared to prior months. Locate air leaks around your doors or windows by walking around with a stick of incense. If the smoke rapidly moves at any point, outside air may have caused the movement. You can caulk cracks or add insulation to these areas and then reevaluate your energy costs afterward. Turn your thermostat a few degrees lower for a month, replace dirty furnace filters or old air-conditioning coils, clean air vents, and close vents in rooms that are rarely used for a month. Evaluate the change in your heating or cooling costs after making these changes. Purchase a kilowatt-hour electric usage monitor to see how much energy your electronics use. You plug the monitor into a wall socket, and then you plug your electronic into the monitor. The monitor tells you how much energy the device is using, and how much the device is costing you. This is ideal for kitchen appliances and large stereos or televisions. Once you see what is using the most energy, replace those items, unplug items when they aren’t being used, or turn down the temperature of items, such as your refrigerator or freezer. Pay attention to how much you use your lights. Is your bill cheaper in the summer because of shorter days? Try replacing your bulbs with fluorescent bulbs, or turning on reading lamps instead of overhead lighting, and match up the same month in previous years when reviewing your savings. Each time you replace an item with an upgraded and/or energy-efficient item, mark it in your data. Each time you evaluate your home, such as testing for air leaks or vacuuming dust out of air vents, mark it in your data so you know when you completed these evaluations and when you’ll need to do it again next year. Pay attention to when your energy bills decrease, and figure out which changes caused the most significant savings. Creating an energy audit will not only help you keep track of your savings, and figure out where you use the most energy, but it will also help you sell your home when that time comes. By having all of this information available for potential homebuyers, you can prove that your energy-efficient upgrades have decreased energy bill costs for them in the future. 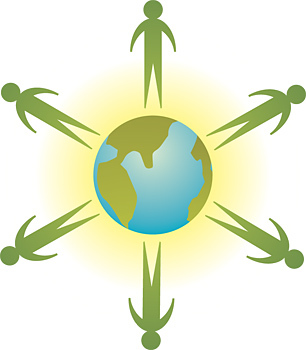 What is the first step you can take to green living? Getting rid of incandescent light bulbs! According to a recent survey completed by a lighting company, 74 percent of the respondents now use compact fluorescent (CFL) light bulbs, which is a huge step to green living! Changing bulbs to energy-efficient models is one of the simplest green changes you can make to your home, and the CFLs save you loads of money by using less energy and lasting longer. 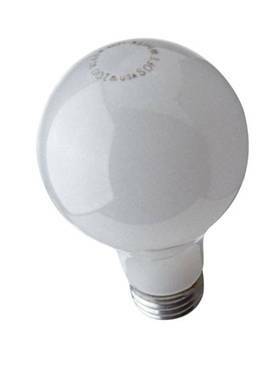 LEDs, which are even more energy-efficient bulbs, are used in 12 percent of the respondents’ homes. Because Congress might pass a law that would ban incandescent bulbs by 2014, why not get a head start on switching them out now? Of those in the study who do not have CFLs or LEDs in their homes yet, 71 percent plan on purchasing them in the near future. If everyone were to participate in this movement, it would save a significant amount of energy and money being spent in households. According to the National Wildlife Federation, each CFL prevents 350 pounds of coal from being burned at power plants during its lifetime. That’s a lot of pollutants that are not being released into the air we breathe! 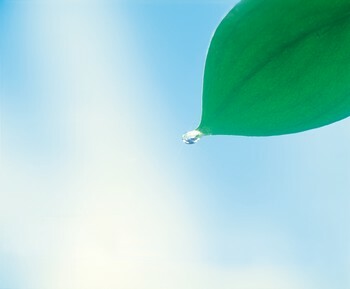 If you’re looking for the first step to green living, here it is. Replace your bulbs. The other steps can come later, when you’re ready.